Take a deep breath and relax…. In recent times, meditation has become a major topic of interest in the field of scientific research. People are becoming increasingly aware of its practice and benefits. A number of scientific studies, on the various types of meditation and relaxation techniques, and their impact on our overall health, have emerged. As a yoga teacher and a practitioner, I am continuously looking for ways to expand my understanding and experience both on and off the mat. In addition to traditional Hatha yoga practice, I am keen to learn more about meditation and relaxation, in order to enhance not only my own practice but also that of my students. It has been fascinating to discover some of the many health benefits of meditation. A PERSON’S STATE OF MIND CAN AFFECT THE BODY ON A PHYSICAL AND GENeTIC LEVEL. The fact that the effects of meditation can be experienced on the level of genes really blew me away! Here are some interesting findings and scientific evidence on meditation and its application for better overall health and well-being. A study from the university of Wisconsin-Madison found that participants who practised Open Monitoring Meditation (non-reactively monitoring the content of the experience internally such as thoughts, emotions, and feelings or externally – sounds, smells, etc.) were able to “attend moment-to-moment to the stream of stimuli to which they were exposed and were less likely to ‘get stuck’ on one stimulus”. Meditation helped to reduce grey-matter density of the brain associated with anxiety and stress. It has also been shown that mindfulness meditation can be effective in the treatment of depression to a similar degree as antidepressant drug therapy. Moreover, research published in the journal ‘Brain, Behaviour and Immunity’ stated that just 30 minutes of meditation a day can help to reduce the sense of loneliness and depression. A study published by the American Journal of Psychiatry showed that after 3 months of meditation and relaxation training 20 out of 22 patients diagnosed with anxiety disorder experienced reduced panic and anxiety. The changes were also maintained at follow-up. Mindfulness meditation has been shown to help with rapid memory recall, visuospatial and working memory as well as sustained attention. A long-term practice has also been reported to increase grey matter density in areas of the brain associated with learning, regulating emotions, sense of self, introspection and compassion. Researchers at UCLA University have found that years of regular meditation practice can help to thicken the brain and strengthen the connections between brain cells. Further research at UCLA Laboratory of Neuro Imaging found that long-term meditation increases the amount of gyrification (folding at the cortex of the brain which promotes and enhances neural processing). According to scientists, gyrification is responsible for improving the brain’s ability to process information as well as to help enhance memory, decision making, attention and ability to focus in spite of distractions. Loving-kindness meditation, part of Buddhist tradition, has been shown to boost one’s ability to emphasise with others, through the cultivation of care and compassion towards all living beings. The meditation practice also helps to cultivate loving attitude towards oneself encouraging self-acceptance, as well as positive feelings towards others, helping to establish new relationships, be open to novel experiences and less prone to social isolation. Researchers at Harvard Medical School found that long-term practice of relaxation through yoga and meditation increased the number of ‘disease-fighting genes’. The experiment showed how responsive genes can be to internal and external factors such as behaviour, mood, and the environment. They coined the term ‘relaxation effect’ to explain the way relaxation can switch on certain genes that fight inflammation, kill diseased cells and protect the body from cancer. Stress generates a fight-flight response in the body, causing the release of the stress hormones adrenaline and cortisol and an increase in heart rate and blood pressure. The muscles contract and tighten, while the digestive and immune functions are reduced. 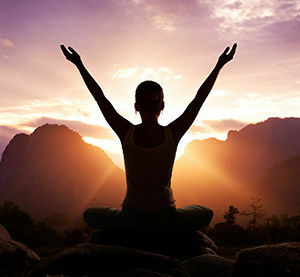 Meditation and relaxation, on the other hand, stimulate the parasympathetic nervous system, causing the body to relax. This induces the opposite effects of stress – heart rate slows down and blood pressure is reduced as blood flows freely through the body, providing its tissues with nutrients and oxygen. Relaxation has been linked to improved digestion, memory and the production of feel-good chemicals such as serotonin and the growth hormone which repairs cells and tissues in the body. Meditation can help to reduce inflammation caused by stress and thus lower the risk of heart disease, arthritis, asthma, and skin conditions such as psoriasis. Research has shown that relaxation can boost men’s fertility while stress can reduce sperm count and motility. Similarly, it’s been found that women are more likely to conceive when they are relaxed rather than stressed. Our cells’ nucleus contains chromosomes, made of protein and DNA. Shortened telomeres, protective compound structures found at the end of a cell’s chromosome, have been linked to psychological stress as well as to increased rate of bodily ageing. Longer telomeres, on the other hand, have been found to boost immunity in cancer patients, protect against disease and slow down the ageing process . Researchers have shown that regular meditation, yoga and relaxation practice can affect us on a cellular level, by decreasing stress hormones and oxidative stress and increasing hormones that may protect the telomere. A study at the Ohio State University found that daily practice of progressive muscular relaxation reduced the risk of breast cancer recurrence.